How well do you know your antique bottles? In recent weeks, I've spent hours trawling the internet admiring vintage perfume bottles. In that time, literally thousands of antique flacons must have passed before my eyes. Last week, however, my wife came upon this charming hand blown glass bottle at a fleamarket here in Denmark... she snapped it up for a very reasonable 20 cents! We both like it for its old-world Art Nouveau aesthetic, but hope to get a fuller picture of the bottle's history. Perhaps you have seen it before? There are no markings, stamps or labels other than those shown here. 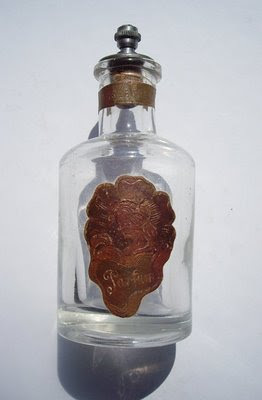 The label around the neck reads "Lilas de France", and the larger sticker depicts a woman in profile, against a five-petalled flower motif, and bears the word "Parfum". I am almost certain that I have seen this very same arts and crafts-style label somewhere on the net, but due to the sheer number of sites I've visited, cannot even begin to think exactly where I might have seen it. Unfortunately, very few photos of these bottles exist, and those that are pictured do not really resemble the one above. So, its over to you, kind reader... perhaps you have some information that will point me in the right direction? Any help you may be able to offer would be enormously appreciated. Despite the mention of music this interview with Brian Eno about perfumery is fascinating. I thought you might like it. I just looked through my book on perfume bottle but no luck.